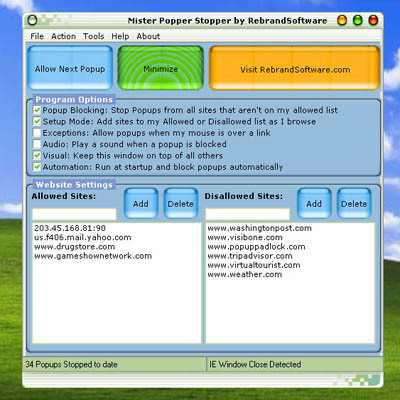 This popup stopper software monitors all open IE windows for popups. Unique "Setup Mode" notifies you whenever a site tries to send a popup, and lets you block it or allow it with the click of a button. Once you turn off Setup Mode, only popups from sites you have specifically allowed will be shown.Unique "Setup Mode" notifies you whenever a site tries to send a popup, and lets you block it or allow it with the click of a button. Unique "Setup Mode" notifies you when a site tries to open a popup and lets you choose whether to allow or permanently block popups from that site. Can be added to Internet Explorer's "Tools" menu for quick and easy access! Qweas is providing links to Mister Popper Stopper 3.0 as a courtesy, and makes no representations regarding Mister Popper Stopper or any other applications or any information related thereto. Any questions, complaints or claims regarding this application Mister Popper Stopper 3.0 must be directed to the appropriate software vendor. You may click the publisher link of Mister Popper Stopper on the top of this page to get more details about the vendor.